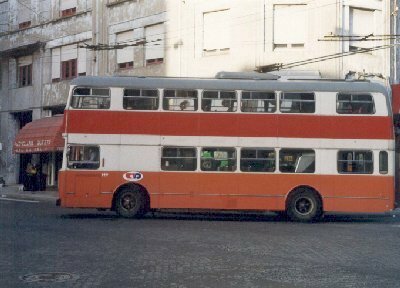 STCP Mercedes bus 2142 at the Largo do Viriato/ Rua da Restauração junction, July 2001. Oporto was a European City of Culture in 2001 but is an attractive destination in any year. In Portuguese, the city is known as Porto, the English form of its name derives from the use of the Portuguese definite article "o" in front of the city's name in certain circumstances. The superb natural setting of the city, on the River Douro, means that it has some striking fixed-crossings including a double-decker 19th-century road bridge and an Eiffel-designed high-level railway bridge of similar vintage (now supplanted by a slender concrete structure). Also, the hilly terrain adds to the city's appeal. Vila Nova da Gaia, opposite Oporto, on the south bank of the Douro, is the home of many port wine companies, most of which offer free guided tours, with samples. Amongst the best organised of these are those at the Cálem, Sandeman and Ferreira lodges. For the transport enthusiast Oporto has a wide and growing range of attractions. In recent years a new Metro system, new furnicular and new cross-river bridges have been built. Sadly, however, its tram network is a pale shadow of its former glory and its single and double-decker trolleybuses have now disappeared. Horse/mule-drawn trams came into service in 1872 and lasted till 1904. Oporto later became the first city in Iberia to introduce electric trams, in 1895, although steam trams had been in use since 1878 and were to last till 1914. Buses were introduced to Oporto in 1948, with trolley buses following in 1959. Trolley buses only ceased operating in 1997. Nowadays only two relatively short lengths of tramway are operative. These both serve Massarelos depot. Route 1E runs along the river-side to Infante, near the historic Ribeira waterfront and runs to Foz in the opposite direction, whilst route 18 has recently had its city terminus at Carmo reinstated many years absence. This page is a companion to the Lisbon Transport page of this website. Separate pages of this site will eventually cover all of the following aspects of Oporto transport. The majority of these pages are already in existence and can be reached by the links below. Oporto's Francisco Sá-Carneiro airport is at Pedras Rubras, north of the city. It is named after the Portuguese prime minister, Francisco Sá-Carneiro; you may not wish to know that he died in an air crash! Direct flights from England include Portugália services from Manchester and British Airways, TAP-Air Portugal flights from London and Ryanair flights to Oprto from Stansted and Liverpool.. The Oporto airport operator is ANA. A new Helitours helicopter service started on 14 June 2002, from Massarelos heliport, offering tourist flights over the city, as well as a service to and from Mesão Frio, to the north, for lunch! Oporto has six major bridges spanning the Douro within a couple of miles of the city centre, the last being completed in 2002. They include Eiffel's railway bridge and a 19th-century double-decker bridge which now carries the Metro on the upper deck. Visit this site's Oporto's Bridges page here for details. The city's bus and tram operator is STCP (Sociedade de Transportes Colectivos do Porto), whose web site is an excellent resource for the visitor. As well as transport details, it also has illustrated tourist information. Oporto is also rich in local and regional coach operators. There are now both an Oporto bus page and a coach page on this site. The Funicular dos Guindais was re-opened as a modern funicular in February 2004; it replaced a system which had been closed for decades More details are on this site's Oporto Funicular page. Picture of Metro unit, above, courtesy of Tony Morehead. A new Metro do Porto light-rail system is now in operation. 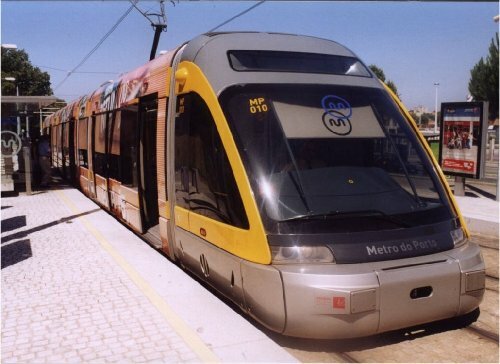 On 22 May 2001 the first of 72 light-rail cars for the Metro do Porto was unveiled at Massarelos and street-running trials of the new vehicles began in June 2002 A revenue service started on 1 January 2003. The vehicles used are seven-sectioned Bombardier (Adtranz) Eurotrams, each with a capacity for 291 people (80 seated). For more, see this site's Oporto Metro page. 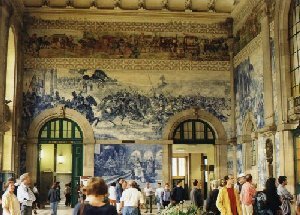 The central railway station is called São Bento and is decorated with superb ceramic tilework scenes (pictured, right) ; however the main inter-city station is some way out of the centre at Campanhã. The main suburban station was Trindade, behind the town hall, but this was recently demolished and the old narrow-gauge CP lines have been replaced by the new Metro. For more on Oporto railways, visit this site's Oporto railway page. For an account of a journey by rail from Oporto to the historic university city of Coimbra, via Aveiro, click here. A fifty-minute cruise on the Douro, from the quay at Ribeira, takes in all the city's bridges but longer cruises are possible. 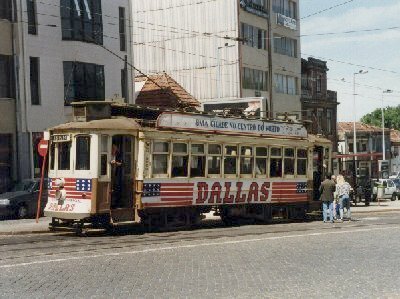 Scenes from the 1990s- L to R: An STCP bogie tram (no.270); "carro belgo" no. 284; trolley-bus no 140. 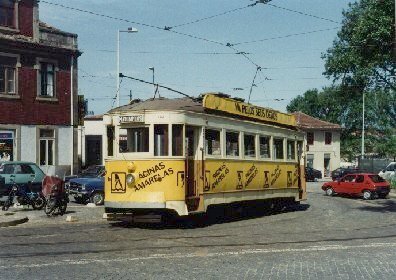 Trams still operate on two short routes in Oporto and the operator, STCP, boasts a fine tram museum at Massarelos, on the river-front. For details see this site's Tram Museum page. The museum also has an excellent web site of its own. The Oporto Transport Museum / Museu dos Transportes e Comunicações is housed in the impressive Alfândega (Customs House) on the river-front. A brief description is here.